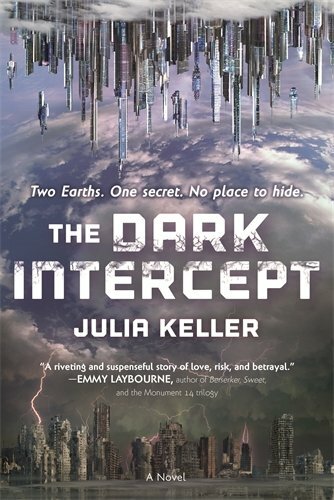 Set on New Earth in 2294, The Dark Intercept is intriguing. Old Earth lies in ruins with only a few people scrounging for life in the dead forests and burnt-out cities where desolation and addiction are the norm. New Earth serenely floats high over the wretched planet’s surface. People live in splendor and beauty on New Earth. They live in privileged plenty. They live in safety without fear of crime. A technology called the Intercept collects every emotion of every person on both segments of Earth through embedded microchips. The Intercept then classifies, sorts, and files the emotions in its gargantuan data bank, waiting for the right time to deploy them back to the person as needed to control undesirable behavior. As in, how many times do you want to relive your loved one’s death? Is five times enough? Ten? And by the way, when you’re bent over sobbing in grief, the police will capture you or shoot you with a slab gun. Violet and her partner are among the one thousand teams that work at Protocol Hall, the Intercept control center. Violet’s dad is the founding father of New Earth. Her boyfriend Danny’s brother, Kendall, invented the Intercept on Old Earth; leaders deemed it so promising they brought the brothers to New Earth and confiscated his device to use as a law-enforcement tool. Kendall is gone now, but Danny is a police officer who helps enforce the Intercept’s rules. The teams at Protocol Hall monitor emotional and behavioral feeds that the Intercept flags as potentially abnormal or which signal impending violence. The teams have the authority to deploy the Intercept—to focus it on the identified person and avert the crime. But not everyone believes the Intercept is a good thing. Rumors that a rebel group has found a way around the Intercept trickle up into New Earth. The Rebels are becoming increasingly audacious in their demands that New Earth terminate the Intersect. Violet knows that Danny often visits Old Earth without authorization, but he won’t tell her why. Is he part of the Rebels? Is he searching for illegal drugs? Violet risks a visit to Old Earth to find out, nearly losing her life in the process. What Violet discovers shocks her, makes her reevaluate everything she knows about New Earth and the Intersect. The book is not perfect. The first 60 pages consist largely of an insecure and whiny Violet agonizing over Danny, constantly wondering if she’s good enough for him. His bad boy image makes her feel stupid. She watches him on computer monitors, talks to him, talks about him, follows him. Violet’s obsession with Danny makes it difficult to identify with or empathize with her. Readers want to bond with the protagonist early on. As with Harry Potter. As with Katniss Everdeen. The writing in some places is flawed with easily remedied blemishes. As narrated, Violet’s thought processes are unnecessarily contradictory. For example, on just one page, something was the same, but not the same. A moment was awkward, but wasn’t awkward. She was nervous and uncomfortable, but never felt more relaxed or happier. And the first person narrative occasionally lapses into an omniscient point of view that momentarily disrupts the flow. In this novel Ms. Keller uses the hijacking of deeply painful emotions to enforce the law as a symbol of far more important questions. How do you weigh the loss of personal freedoms against the value of a stable society? And how can that society morally balance a population that has everything, with the desperate need of those who have nothing? She offers one possible outcome to these timely questions. Intriguing. Connie Goldsmith has reviewed more than 900 children’s books over the past fifteen years. She writes nonfiction history, health and science books for older children, and is a member of the Society of Children’s Book Writers and Illustrators, and the Authors Guild.